Planning a shutdown? Lower your costs by reading and applying this unique reference! Originally designed as an intensive course and then honed over several years, Managing Maintenance Shutdowns and Outages organizes the details of a maintenance shutdown into a manageable form by introducing all the steps needed for a successful shutdown or outage. It includes detailed steps for each phase (initiation, planning, execution, closeout, lessons learned), massive master lists of everything you will need to do for each phase of shutdown, and numerous checklists that can immediately be put to use. Loaded with examples from many industries and actual events, this book will be an extremely useful and practical guide for maintenance managers, project engineers, supervisors, maintenance engineers, and planners working in any heavy maintenance environment. • Brings together the issues of maintenance planning, project management, logistics, contracting, and accounting for shutdowns. 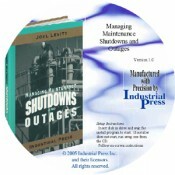 • Includes hundreds of shutdown ideas gleaned from experts worldwide. • Contains procedures and strategies that will improve your current shutdown planning and execution. • Offers examples to illustrate the major points.